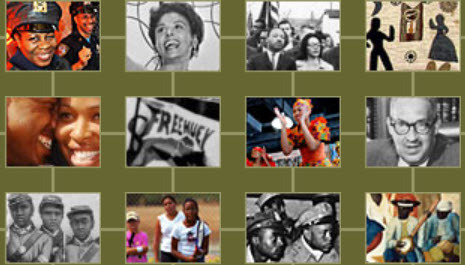 The Schomburg Studies on the Black Experience is a unique database detailing the rich tapestry of the African experience throughout the Americas. Explore interdisciplinary topics through in-depth essays; read the seminal research and timelines that accompany each topic; and search for images and film clips to provide another dimension to your research. Investigate both historical viewpoints and new methodologies to better understand the complex nature of Black Studies today. This resource evolved from former Chief of the Schomburg Center for Research in Black Culture Howard Dodson, whose vision was to provide an encyclopedic treatment of the formation and development of Black studies. During his tenure at the Schomburg Center for Research in Black Culture, Mr. Dodson helped to establish the library as a world renowned research institution. From the early days of establishing the first Black studies programs to current dialogues on the value and need for the discipline, Howard Dodson has participated wholeheartedly in the debate. And no matter how the discipline is defined, scholarship is a necessary component. Thus there will always be a vital need for scholarly resources. This formal collaboration began with a meeting between ProQuest, Howard Dodson, Colin Palmer (Princeton University), and a group of leading academics. The discussion centered upon the complex nature of Black studies and how best to represent the integral disciplines/subjects that make up any foundational research. ProQuest agreed to design and build the database; Howard Dodson would serve as Series Director; and Colin Palmer would act as Managing Editor for the project. Leading academic experts would survey the existing research on their respective topics and then write a unique analysis of the seminal literature they chose. Overview Essays: Each essay is self-contained, but the essays link together to provide an interdisciplinary survey of the experience of peoples of African descent. Centering on African Americans, African and Black Caribbean experiences are examined as well. The multi-dimensional and multi-disciplinary aspects are thoroughly explored. Disciplines include history, religion, sociology, political science, economics, art, literature, and psychology. Intersections and divergences, evolving research theories and historical foundations are scrutinized. Ongoing debates and controversies are presented as well, with a goal of encouraging continuing scholarship. Key resources consist of academically vetted research chosen to best represent the existing literature. These selected articles, book chapters and primary sources provide students with a core understanding of the topic and give them a strong foundation on which to build. The student can better determine the avenues they wish to pursue in their own scholarly ventures or for personal growth. Timelines for each essay list important people, places and events that contribute to the framework. Knowing who, what and where leads you to a better understanding of why. Each individual timeline also becomes part of the database timeline where topics can be viewed within a larger context (i.e., what historical events framed literary works). Bibliographies for each essay allow the library to link to their own holdings and will help with collection development. The researcher can quickly determine the location of further readings and build a reading list in My Archive. Multimedia is represented with an image and video library linked to respective essays. Over 2,000 images and 200 video clips add a visual perspective to the research process. The multimedia library is fully captioned and keyword searchable. Glossaries are provided for each essay. Key terms, people, places, events and organizations are defined in context. A brief definition is available with a mouse-over; clicking on the word will open the full glossary with a more detailed treatment. Reference texts are also included. Handbook of African American Literature(University Press of Florida, 2004) provides an A to Z list of 415 literary terms, ages, movements, periods, and cultural sources with specific examples from the works of major critics and writers from the 1700s to the present. Information and cultural sources range from folk legends to hip-hop music. Encyclopedia of African Literature(Routledge, 2009) covers the key historical and cultural issues in the field with over 600 entries covering criticism and theory, African literature's development as a field of scholarship, and studies of established and lesser-known writers and their texts. The date range starts from the earliest eras of story-telling and oral transmission, with the majority of content covering the twentieth century.